The White Lady ghost was based on a local legend . Diane worked with model Jacqui Godfrey for a week. 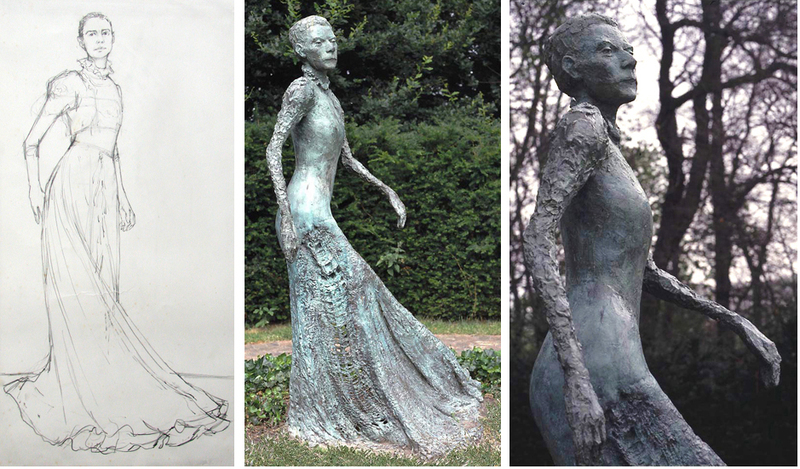 After drawing, photographs and making three maquettes, the life size sculpture was made in direct plaster and cast into bronze. The skirt curves round in a sail like form with a pattern of holes so one can see through the ghost - even though its a solid sculpture! Initially it was a good likeness of Jacqui but looked too attractive. Diane re-worked the face to look more severe, and the arms to look bonier, with the aim of making the figure a little more frightening. In 2007 she was removed from the Maze at Bewsey Old Hall, and stored at the premises of Baldwin Landscape, Anderton and from there she was stolen. Made by Tony Doughty, Blacksmith in Frodsham to Diane's design for the gates into the maze.